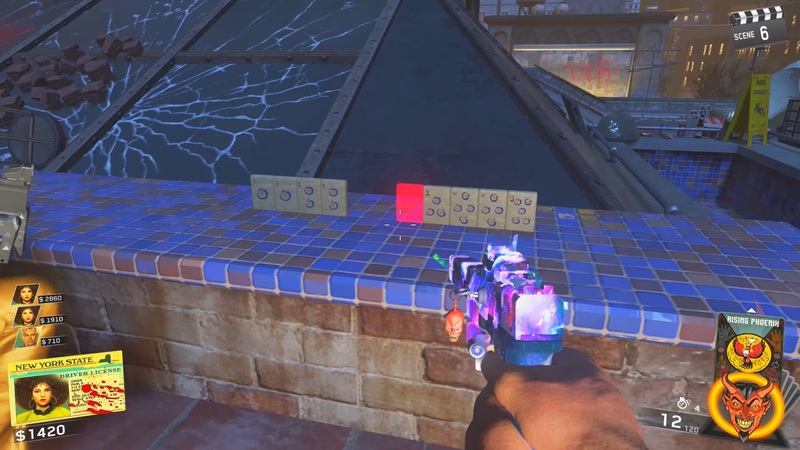 Here’s how to complete the Skull Buster easter egg and get permanent Perkaholic in Shaolin Shuffle. 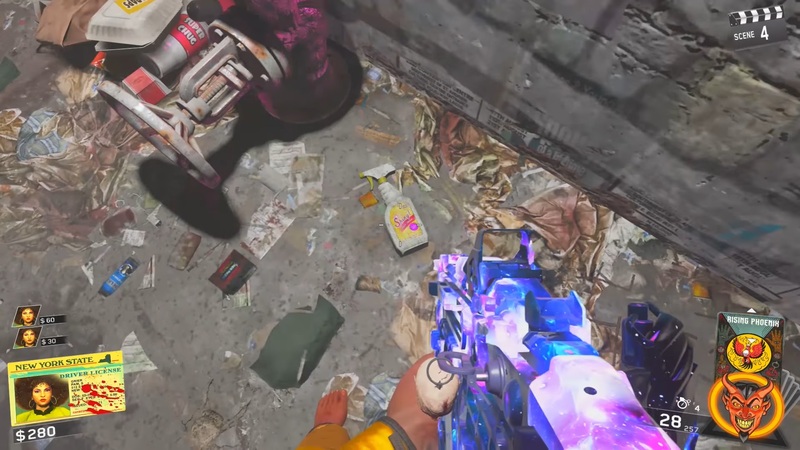 The Shaolin Shuffle Zombies Skull Buster Easter egg in Call of Duty: Infinite Warfare is similar to the Ghosts ‘N Skulls Easter egg in the previous two zombies maps. Completing the Skull Buster arcade game rewards players with a permanent Perkaholic for the remainder of their game session, which will come in handy for the main Rat King boss fight later on. 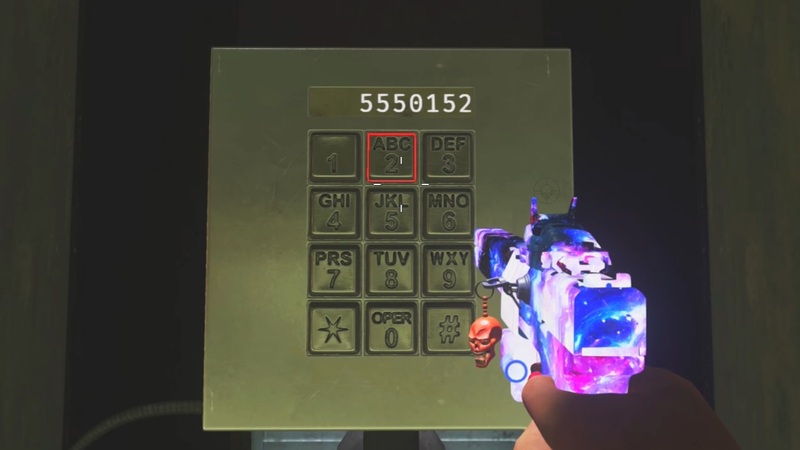 This guide will explain how to complete the Shaolin Shuffle Skull Buster Easter egg and unlock Perkaholic. The Skull Buster arcade cabinet is inside the Disco Lounge on the top floor. 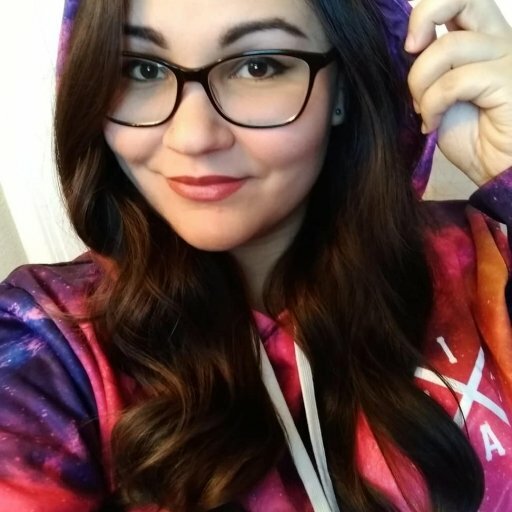 The goal is to enter the arcade unit and complete the mini game to unlock Perkaholic. In order to enter the Skull Buster game, you must first collect six Skulls by completing specific steps throughout Shaolin Shuffle. Special thanks to CodeNamePizza for the helpful tutorial. Check out his video below for a visual walkthrough. Before you can enter the Skull Buster arcade cabinet, you’ll need to clean the blood off the screen using a rag and glass cleaner. These items each have three locations where they can spawn. On top the table beside the brown couches upstairs in the disco lounge, a few steps away from the Skull Busters arcade unit. Inside of Heebee Jeebees, on the floor to the left of the stage. In the underground subway, beside the boxes and papers adjacent to the lockers. On the rooftop terrace of the Inferno Room, on top of a stack of wooden pallets. Inside the Rat King’s lair, on top of the pizza boxes beside the throne. On top of the scaffolding in the alley near the Bombstoppers perk. Once you have both the rag and cleaning spray, return to the Skull Buster arcade machine and clean the blood off the screen. To acquire the next Skull, you must collect a series of missing Mahjong tiles and place them on the rooftop terrace in the correct order. The Mahjong tiles are found in several locations throughout Shaolin Shuffle. On a red circular table on the rooftop terrace, not far from the final Mahjong game itself. Inside the Disco lounge, on the edge of a drink holder on a pillar beside the catwalk. On top of the bar in the Disco lounge, next to a pizza box. On top of a table in the VIP section of the Disco lounge. On the bar top in the Heebee Jeebees concert area. On a small red crate in the backstage area of Heebee Jeebees. On a small red crate on the rooftop near Racing Stripes. In the underground subway, on top of a wood bench. On the pallets to the left of the Blue Bolts machine. Once you have all of the missing Mahjong tiles, you’ll need to place them in the correct order on the rooftop terrace. If you don’t know how to play Mahjong, use this Mahjong calculator to figure out the order the tiles should go in. When all of the tiles are placed correctly, fireworks will shoot up from the Mahjong tiles and another Skull will be placed on the Skull Busters machine. This next step requires you to shoot a certain pattern into the squares of designated windows throughout the map. The windows that you must shoot a pattern into will always have a set of lit candles to the left. 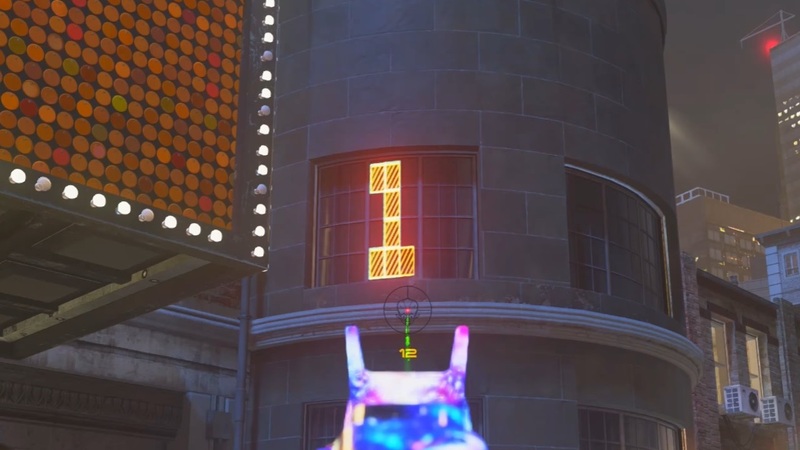 Outside of the Inferno Room, shoot the number “1” into the middle of the top left window. After doing so, the number will flash and the candles will disappear. 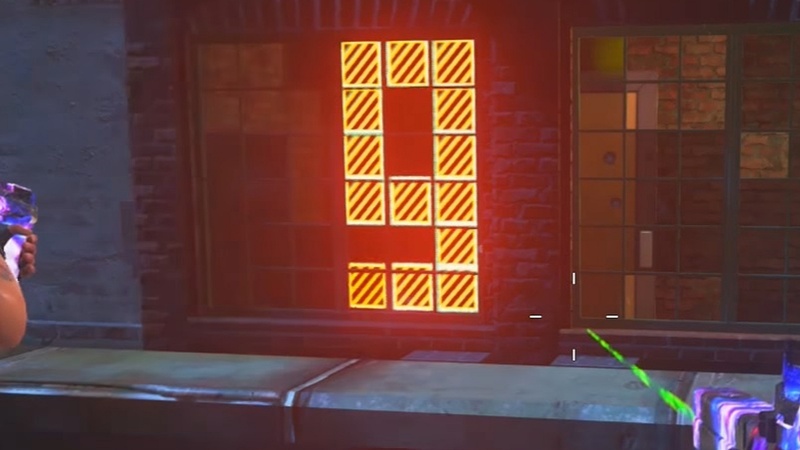 Next, locate a set of windows directly across from Racing Stripes and shoot the number “9” into the left window, the one to the right of the lit candles. The third window is not really a window, but a panel of bronze wall tiles instead. Look for the bronze tiles inside the Inferno Room next to the stairs, and shoot the number “7” into the tiles on the right. 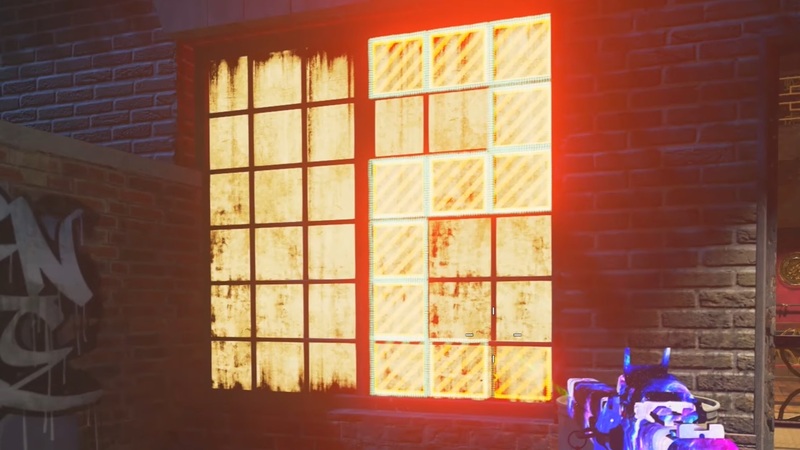 The final window that you must shoot a symbol into is the one outside of the Black Cat Dojo. Shoot a number “2” into the window on the right, and you’ll receive another Skull on the Skull Buster machine. 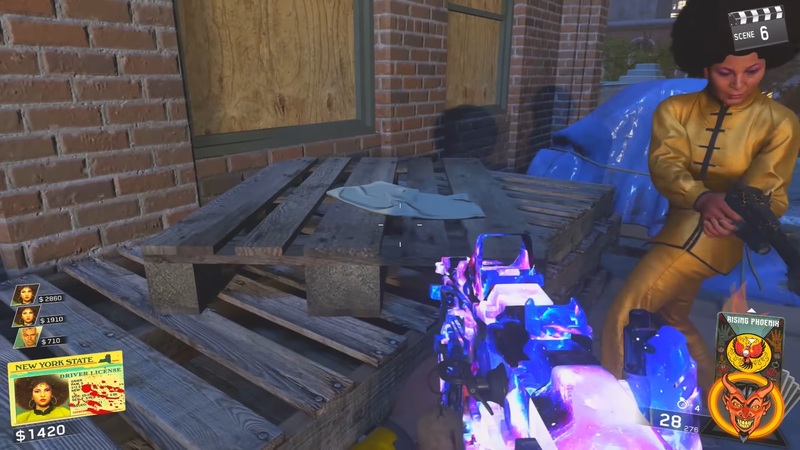 The numbers spell out "1972", which is likely when the Shaolin Shuffle Zombies DLC is supposed to take place. After completing the first three steps, head over to the Racing Stripes perk machine on the rooftop of Heebee Jeebees. Look up to the left to find a flat white circle floating in the air. You’ll have to hop onto this white disc, and continue hopping across a series of these discs until you reach the end and earn your next Skull. 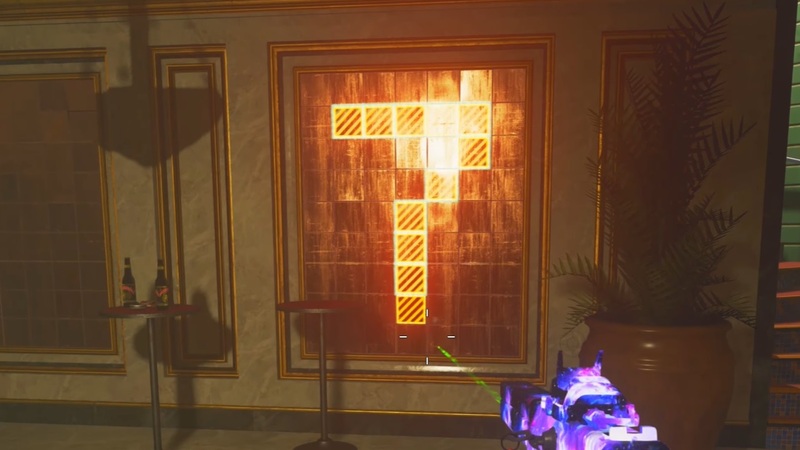 Again, thanks to CodeNamePizza for the Skull Buster Easter Egg tutorial. Okay, so this one is a bit disappointing to hear if you’re playing solo, but you’ll have to do it if you want to earn the next Skull. 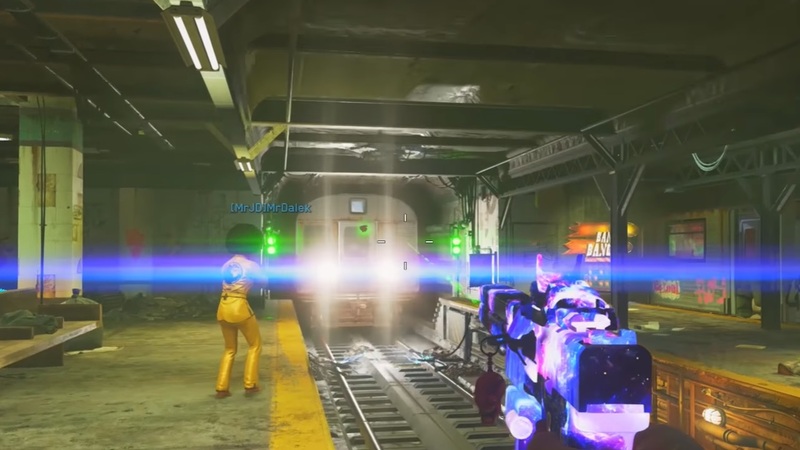 Go down to the underground subway where the Bang Bangs perk machine is located. You’ll notice that the train will now have a Skull on the front of it. To get the Skull, you or one of the members of your party needs to jump in front of the train to snag the Skull. Revive the player afterward. On the front of the Skull Buster arcade machine, there’s a service phone number printed on the upper left near the logo. Head to one of the pay phone machines down in the subway, and type the number into the number pad. A strange voice will play after doing so. This should give you your sixth and final Skull to play Skull Buster. 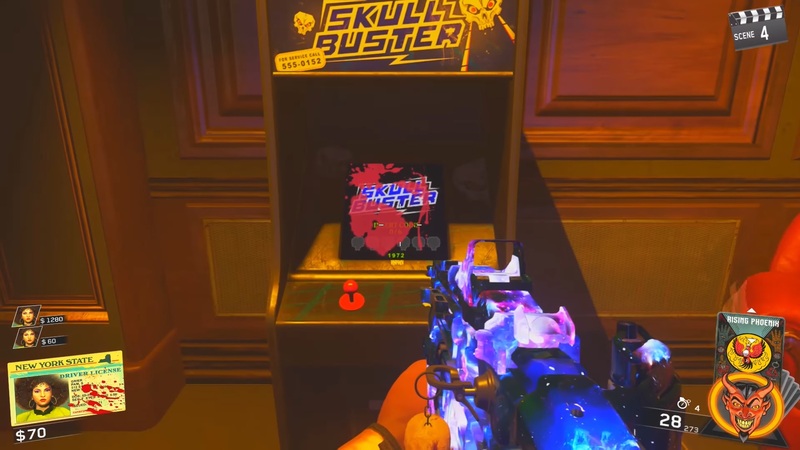 After collecting all six Skulls, you can now enter the Skull Buster arcade game. 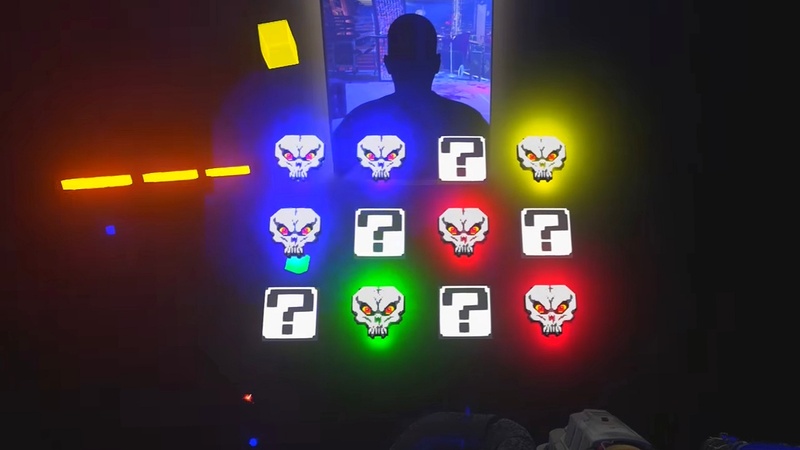 The game itself consists of a panel of skulls, question marks, and a series of colored cubes that float around the room. Skull Buster is basically a match-three game. Use R2 or the right bumper on your controller to grab a block, and press R2 again to release it. The goal is to release the colored block onto a question mark on the panel to create a series of connecting skulls of the same color. Three matching skulls in a row, column, or triangle shape causes them to disappear. Make all the skulls disappear over three rounds to unlock Perkaholic. Once again, special thanks to CodeNamePizza for the helpful tutorial. Check out his video below for a visual walkthrough. 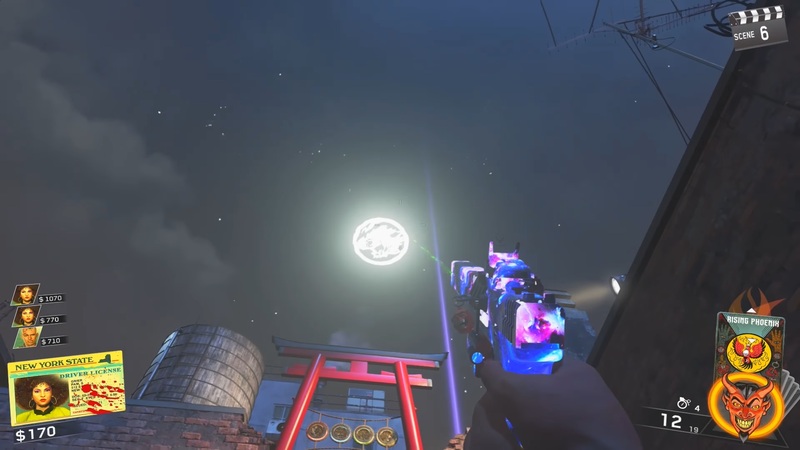 Once you complete the Skull Buster Easter egg and earn Perkaholic, you’ll unlock the Coin-Op trophy/achievement and have Perkaholic for the remainder of your Shaolin Shuffle Zombies session, even if you go down.